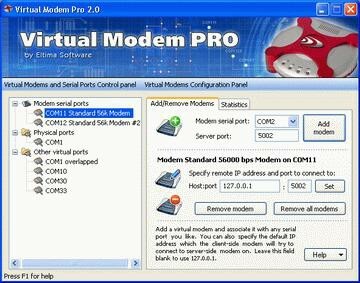 Virtual Modem PRO 3.0 is remote computing software developed by ELTIMA Software GmbH. Virtual Modem PRO works for every automation system that collects data from remote hosts using modem and telephone line. Virtual Modem PRO creates virtual com ports and attaches virtual modems to them, which work in the same way as real ones (support Hayes AT commands), however use TCP/IP protocol to connect to remote host. This gives better speed and reliability of transmitted data as well as up to 255 modems that can be created in any system. This program is shareware, which means you can download and use Virtual Modem PRO 3.0 for free during 30-days trial period. After this period you gonna have to buy Virtual Modem PRO 3.0 software for $99.95 or uninstall the program. Virtual Modem PRO 3.0 supports different languages (including English). It works with Windows XP/Vista. Latest Virtual Modem PRO 3.0 does not contain any spyware and/or advertise modules, allowing installing it with no worries concerning valuable information loss. Our website has thoroughly tested network & internet product Virtual Modem PRO 3.0, written the review and uploaded installation file (3656K) to our fast server. Downloading Virtual Modem PRO 3.0 will take minute if you use fast ADSL connection. Two virtual serial ports linked to each other via virtual null-modem cable.